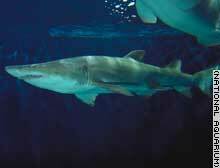 A sand tiger shark swims in the National Aquarium's 225,000-gallon tank. (CNN) -- Sharks' already maligned reputation may have taken an even deeper dive as a result of the media frenzy surrounding attacks on U.S. beaches two years ago, a survey released Thursday suggests. Seventy percent of the 1,010 Americans surveyed recently by the National Aquarium in Baltimore, Maryland, believe that sharks are dangerous. And 72 percent believe that shark populations are just right or too high. Just the opposite is true, said George Burgess, a marine biologist who heads the International Shark Attack File. "Prior to 2001, the public was becoming more aware of the need for shark conservation," Burgess said. "But the 'summer of the shark' changed all that. ... Public perception took several steps backwards to the 'Jaws' mentality." Scientists say people are more likely to be hurt by a hamster than by a shark. Research shows that some shark populations � including the great white shark that was the villain in Stephen Spielberg's thriller "Jaws" � are facing steep declines of up to 90 percent in the last 15 years. "The summer of the shark" � as it was trumpeted on the cover of Time magazine -- increased the fear that many people feel toward the silent sea cruisers, Burgess said. The media coverage was prompted by a bull shark biting off the arm of an 8-year-old boy on a Florida beach July 6, 2001. Overnight, shark bites and sightings became major international news, triggering countless TV news reports and front-page stories and culminating in the Weekly World News tabloid declaring: "Castro trained killer sharks to attack U.S."
Lost in the hoopla was the fact that in 2001 there were 13 fewer attacks worldwide than the year before, Burgess said. The same year, four human deaths were linked to shark bites compared with 13 in 2000, he added. "The public's fearful fascination with sharks is matched only by the media's google-eyed gullibility," Miami Herald columnist Carl Hiaasen wrote. "Hype [was] the inevitable result." People are 250 times more likely to be killed by lightning than by a shark, scientists say. Recent studies suggest the last quarter century hasn't been easy for sharks -- sleek predators who have been around for at least 400 million years. With the exception of the makos, all 400 species of sharks have declined at least 50 percent in the last eight to 15 years, a study in January's Science journal found. The strains on their populations come primarily from pollution and overfishing, said Alan Henningsen, a marine biologist and shark researcher at the National Aquarium. Sharks also take much longer than most fish to reach sexual maturity � 12 to 18 years in some species, he said. And they typically produce far fewer offspring � often one or two pups per female. While federal regulations restrict shark fishing in U.S. waters, the animals are still fair target in much of the world. Their cartilage is used as a cancer treatment in some countries and shark-fin soup is a sought-after delicacy in Asia, Henningsen said. But Henningsen and others say the persistent drops in shark populations could throw the marine food chain off balance. "There is a lot about sharks that we still don't understand," he said. "That's why we have to continue studying and protecting them." They're not cute and cuddly. ... People are all over the dolphins and other mammals. The National Aquarium Shark Quest exhibit, which opens this week, will try to dispel myths about the animals by bringing people and the predators closer together. The exhibit, which runs through the end of the year, lets visitors see several species of sharks in the aquarium's giant fish tank and even touch small bamboo sharks. Burgess said he hopes such education programs will help to counter the damage done by the media coverage in 2001. "We have to get the truth out," he said. "Sharks are not bloodthirsty killers. They're amazing animals that deserve our respect and need our protection."